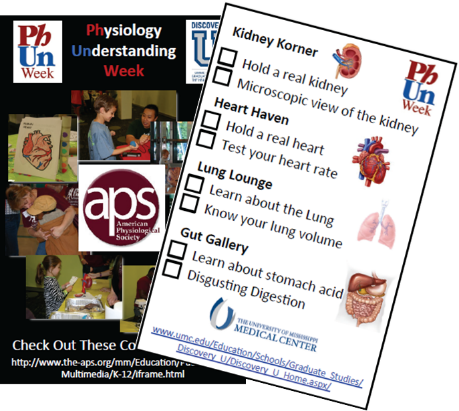 We were first introduced to PhUn Week about a decade ago through our service to the APS Education (Mike) and Trainee Advisory (Jenny) Committees. 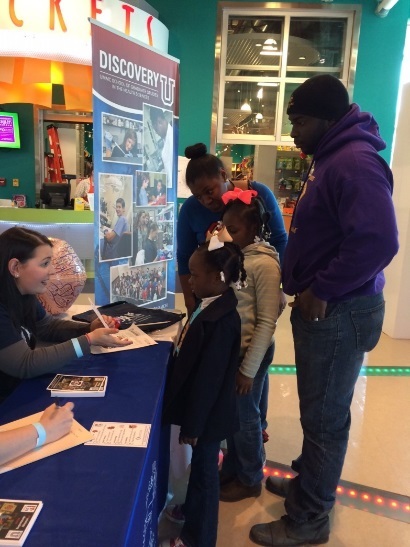 We both began our involvement with this annual event by visiting our children’s schools in Mississippi and Florida, but in 2013, we combined efforts with other faculty, fellow, students and staff at the University of Mississippi Medical Center (UMMC) to bring PhUn Week to a larger audience at the Mississippi Children’s Museum. Through this event every year, we reach over 300 children and parents, and we have over 40 volunteers who spend their Saturday operating 9 different stations. In addition to being an outreach event for the Jackson, MS community, this PhUn Week event also provides professional-skill-building and team-building opportunities for our students and fellows. Although the first time we held this event at the museum, it required a lot of planning and preparation by faculty, now the event is almost completely run by fellows and students from the Departments of Physiology and Pharmacology. We have also worked with the UMMC School of Graduate Studies that provides additional support for our event. Eight team leaders are responsible for recruiting a team of volunteers, training those volunteers on the activity for that station, and making sure all of the supplies are ready and within the budget for the event. 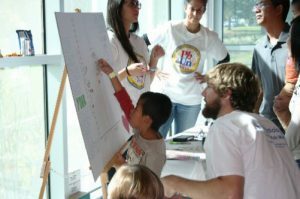 Team leaders are responsible for setting up meetings before the event to discuss best practices for running the station and for ways to engage the children in the activities. 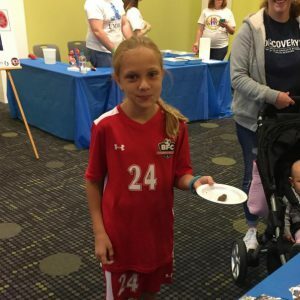 This is a great way for students, fellows, and faculty to learn to talk about science with the public – sometimes the parents have more questions than their children! The event was divided into 9 stations with 4 organ system based themes. At the welcome station, volunteers greeted museum patrons to encourage them to visit the special PhUn week event. Each participant received an activity card and earned “check marks” for every station they visited to help them keep track of which stations they had completed. 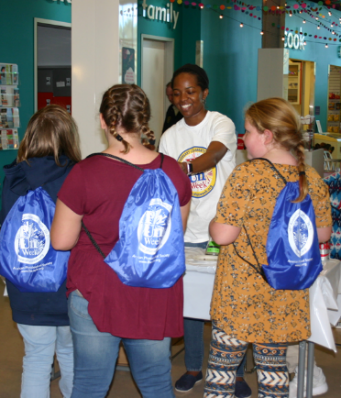 When the children were done touring the stations, they returned to the welcome table to receive their PhUn week goodie bags. At the “Gut Gallery,” children learned about the digestion process by making “poop.” Each child got pumpernickel bread to tear apart (action of the teeth) to squeeze down the neck of a balloon (the esophagus) with some help from soapy water (saliva). Once the bread was in the body of the balloon (the stomach), the children added vinegar (stomach acid) and began to churn the mixture. The children then inverted the balloon so that the neck of the balloon became the intestines / colon, and then squeezed out the “poop.” The kids give a big smile or a loud “GROSS! !” after that! 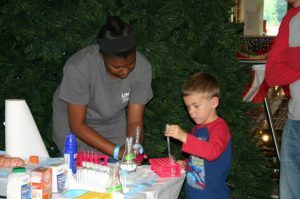 At the next station, the children explored how over-the-counter antacids can neutralize stomach acid. We used Sprite as our “safe for children” acid, and we let the children pipette Sprite and red cabbage dye (pH indicator) into 4 plastic test tubes. Then, they mixed in Tums, Alka Seltzer, Milk of Magnesia, or baking soda to observe the color change as the solution became more basic. Note – milk of magnesia usually has the biggest pH shift – but the Alka Seltzer is fun when it bubbles!! The “Heart Haven” station was focused on learning about the structure of the heart through real fixed hearts, plastic models, and computer animations. Participants were able to examine formalin fixed hearts taken from vertebrate animals at the time of sacrifice (canine, ovine). The fixed hearts (stored in ethanol) were rinsed in water for 1 week in order to avoid any problems with touching alcohol. The hearts were hemisected prior to the visit so that the students could easily examine the chambers, valves and major blood vessels of heart. 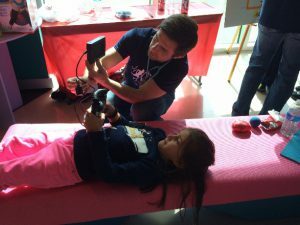 Then, the children examined how going from resting to doing jumping jacks could change their heart rate using Vernier Physiological Monitoring Systems to measure heart rate. The children plotted their data on a graph (x-axis: resting or exercising, y-axis: heart rate) to visually show the impact of activity on heart rate. 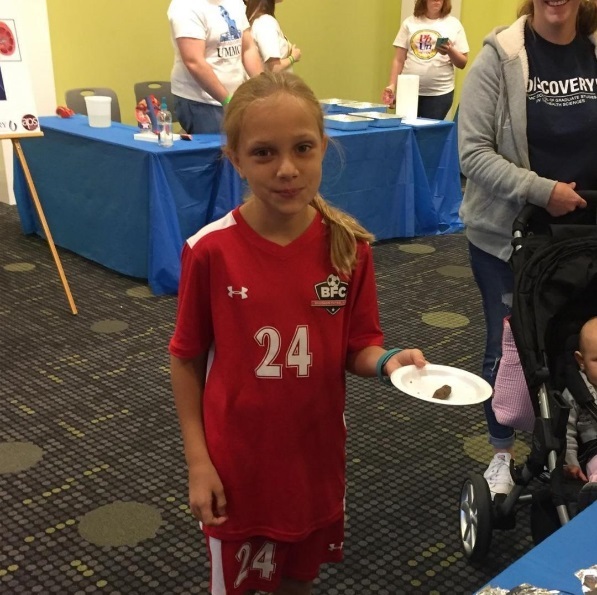 At the “Kidney Korner” station, we again provided plastic models and formalin fixed kidneys (canine, ovine) so that the children could learn about the structure and function of the kidneys. The kidneys were hemisected prior to the visit so that the students could easily examine the renal cortex, medulla and papilla. 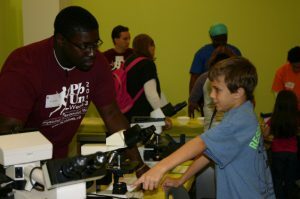 The volunteers explained the basic anatomy of the kidneys and how each organ is made from individual, specialized cells, and then the children viewed histological sections from normal kidneys and diseased kidneys (glomerulosclerosis, diabetic kidney disease, fibrosis). 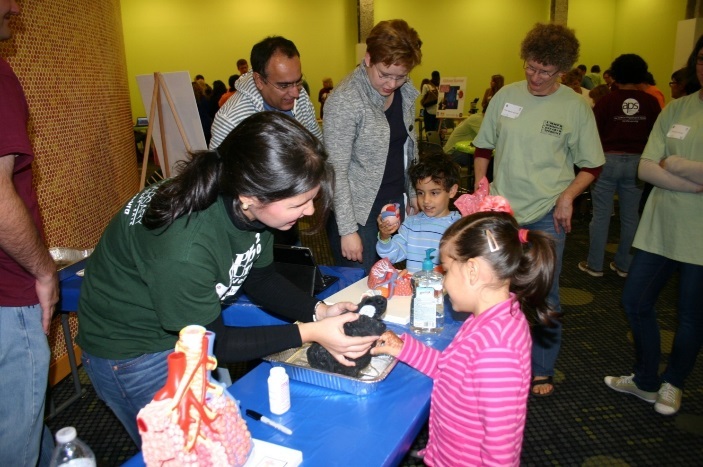 One of the most popular stations for children and their parents is the “Lung Lounge.” Children learned about lung structure and function using plastic models and computer animations, and they got to see real fixed human lungs from a smoker, a patient with emphysema, and a healthy patient. The children were quick to note how bad smoking is! 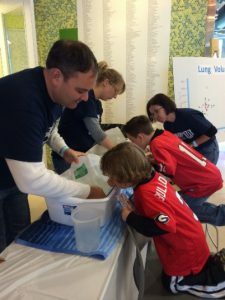 The children then got to measure their lung volume (and sometimes challenge their siblings or parents to a contest) using basic household items like milk cartons and straws. Pre-marked gallon containers were filled with water and turned upside down in a water filled bucket. Using a bendable straw inserted into the opening of the gallon container, children were instructed to inhale maximally and then exhale maximally into the straw. The exhaled breath displaces water in the gallon jug to allow for measurement of lung capacity. The children then plotted their lung volume as a function of age to see how lungs grow with age. If you’re attending the Experimental Biology conference, come visit us at the Sunday morning poster session (7:00 AM) to talk with APS members who have been involved in various PhUn Week activities. It is a great way to get more ideas and learn what works and what doesn’t as you get ready to plan your next event! Michael J. Ryan, PhD, is a Professor of Physiology and Director of Graduate Studies in Physiology and the Associate Dean of Student Affairs in the School of Graduate Studies in Health Sciences at the University of Mississippi Medical Center in Jackson, MS. His research is focused on the role of immune system dysfunction in the development of hypertension, and on the impact of placental ischemia in the brain. 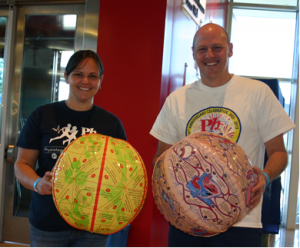 He is a former member of the APS Education Committee and has participated in PhUn activities since 2009. Jennifer M. Sasser, PhD, is an Associate Professor of Pharmacology and Director of Graduate Studies in Medical Pharmacology at the University of Mississippi Medical Center in Jackson, MS. Her research is focused on mechanisms of hypertensive kidney disease and preeclampsia, a hypertensive disorder of pregnancy. 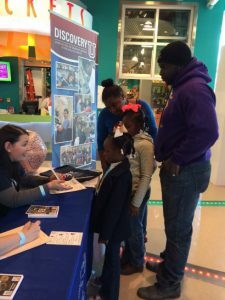 Jenny became involved with PhUn week activities in 2010 when she was a postdoctoral fellow at the University of Florida, and she now serves on the APS Education Committee. This is such a wonderful opportunity for elementary students. The Heart Haven’s use of the Vernier technology and giving the students an opportunity to graph was phenomenal. The good thing is that the students had to graph without the use of technology. Great work! !